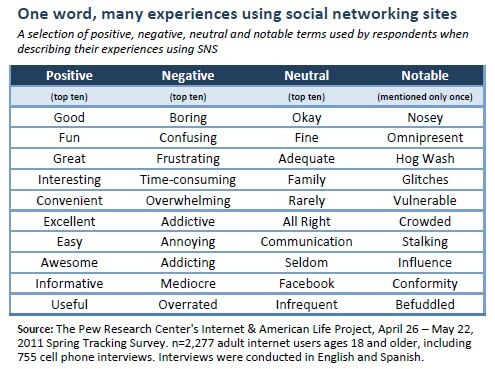 65% of online adults use social networking sites, and most describe their experiences in positive terms. Two-thirds of adult internet users (65%) now say they use a social networking site like MySpace, Facebook or LinkedIn, up from 61% one year ago. That’s more than double the percentage that reported social networking site usage in 2008 (29%). 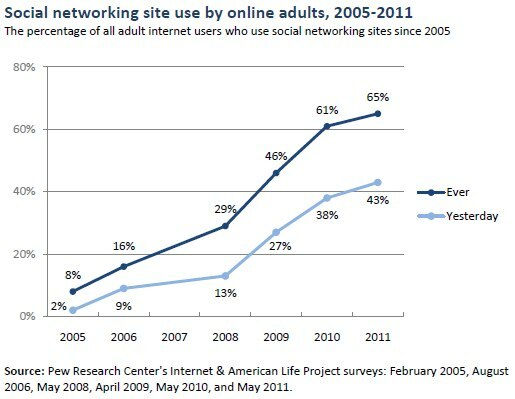 And for the first time in Pew Internet surveys it means that half of all adults (50%) use social networking sites. The pace with which new users have flocked to social networking sites has been staggering; when we first asked about social networking sites in February of 2005, just 8% of internet users – or 5% of all adults – said they used them. Only email and search engines are used more frequently than social networking tools. Among internet users, social networking sites are most popular with women and young adults under age 30. Young adult women ages 18-29 are the power users of social networking; fully 89% of those who are online use the sites overall and 69% do so on an average day. As of May 2011, there are no significant differences in use of social networking sites based on race and ethnicity, household income, education level, or whether the internet user lives in an urban, suburban, or rural environment. Women maintain a foothold on social networking sites. 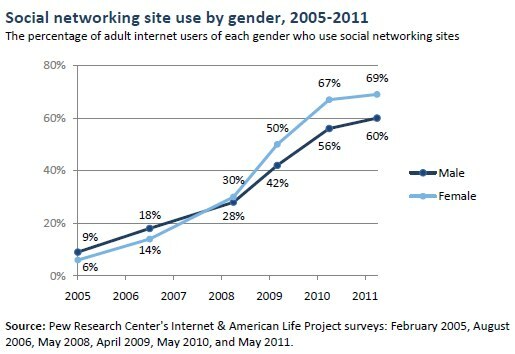 Looking more closely at gender differences, women have been significantly more likely to use social networking sites than men since 2009. As of May 2011, nearly seven in ten online women are users of social networking sites (69%), compared with six in ten online men (60%). Women are also more active3 in their use of these sites, with almost half of female internet users using social networking sites on a typical day (48%), compared with 38% of male internet users. The frequency of SNS use among young adults was stable over the last year, while usage among older users increased. Social networking sites have been very popular with young adults ages 18-29 almost since their inception. Between February 2005 and August 2006, the use of social networking sites among young adult internet users ages 18-29 jumped from 9% to 49%; during this same time period, use of these sites by 30-49 year olds remained essentially unchanged. Since then, users under age 30 have continued to be significantly more likely to use social networking sites when compared with every other adult age group. 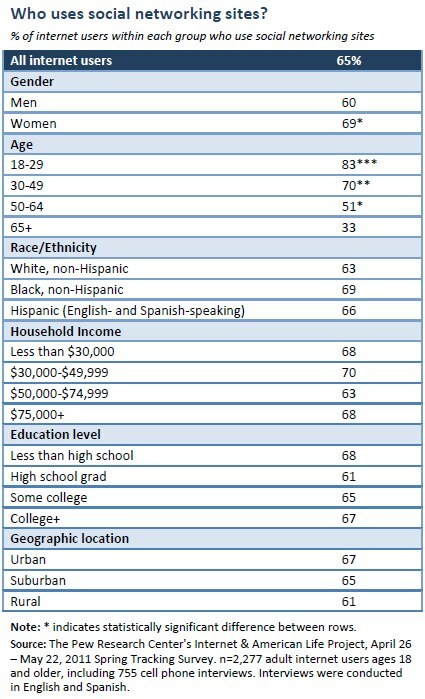 As of May 2011, over eight in ten internet users ages 18-29 use social networking sites (83%), compared with seven in ten 30-49 year-olds (70%), half of 50-64 year-olds (51%), and a third of those age 65 and older (33%). However, while young adults have consistently been the most likely to use social networking sites, internet users in other age groups have seen faster rates of growth in recent years. 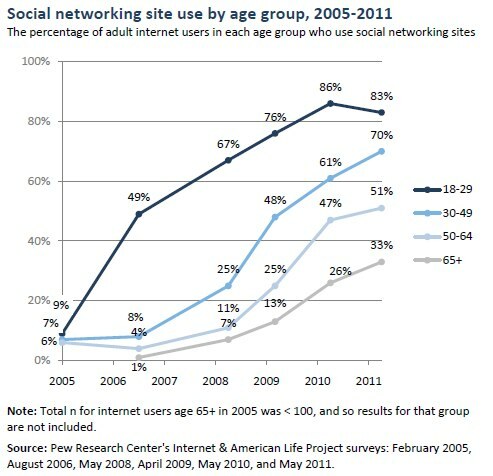 In the past two years, social networking site use among internet users age 65 and older has grown 150%, from 13% in April 2009 to 33% in May 2011. Similarly, during this same time period use by 50-64 year-old internet users doubled—from 25% to 51%. Usage patterns on a typical day reveal a slightly different picture. The frequency of social networking site usage among young adult internet users was stable over the last year – 61% of online Americans in that age cohort now use SNS on a typical day, compared with 60% one year ago. At the same time, those ages 30-49 have become somewhat more likely to use the sites on an average day; the frequency of SNS use among this age group grew a modest 18% (from 39% to 46%) over the past year. 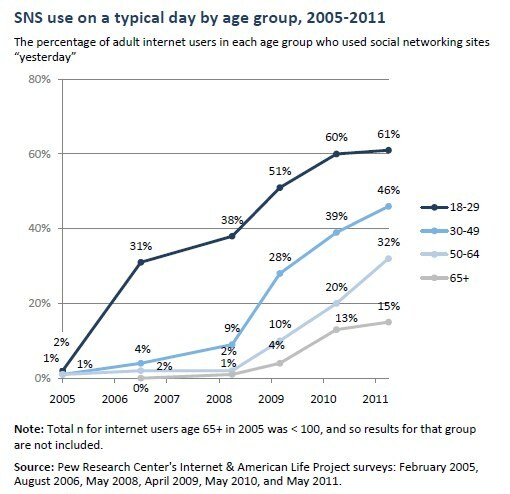 However, among the Boomer-aged segment of internet users ages 50-64, SNS usage on a typical day grew a rigorous 60% (from 20% to 32%). And unlike the general growth in SNS adoption among those ages 65 and older, the frequency of use among the oldest group of internet users did not increase significantly over the past year. Ask about social networking and good thoughts generally come to mind. However, negative responses were recorded for roughly one in five respondents who answered this question and these answers included a far more diverse array of adjectives and, at times, expletives. Frustrations were evident among respondents who described their experiences using the networks as “annoying,” “overwhelming,” “boring,” “confusing” and “overrated.” Many respondents offered the words “addictive” or “addicting” as the first thing that came to their mind, while a sizable ambivalent group said their experiences had simply been “okay.” These neutral descriptions were also quite varied, though terms that indicated little experience with the sites—such as “Rarely,” “Seldom” or “Occasionally”—were common in this group.